While New York City is seemingly overrun with food halls, a new Asian-influenced hall, located at the intersection of Soho and Chinatown, is banking on the fact that the city isn't over them yet. 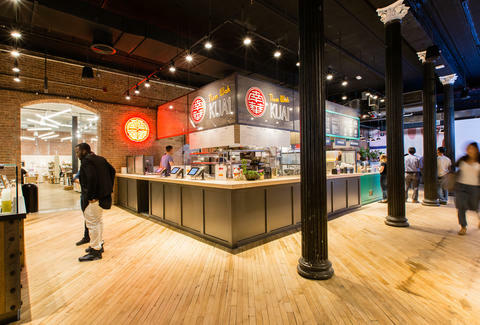 Canal Street Market, which takes up 12,000sqft at 265 Canal, opened its retail side back in December, but the food hall is brand-new, boasting spin-offs from several already-established NYC favorites like Nom Wah, Ippudo, Uma Temakeria, Boba Guys, and more. There’s also a rotating culinary incubator space, selected monthly by the market, that challenges chefs to experiment with food and create dishes inspired by the surrounding neighborhood. The market, which sports modern wood finishes, high ceilings, and a seating area bathed in natural light from an above skylight, aims to "[provide] a sanctuary away from the bustling city landscape for locals and visitors to experience in their own way," according to founder Philip Chong. Here’s an inside look at some of the highlights from the new Canal Street Market. The sleek and airy market showcases the array of food stalls in the front of the space, and an assortment of standing-only tables at the very back. Untamed plants line the walls by the seating area, alongside an on-brand millennial pink mural. Dim sum masters Wilson Tang and Chef Jonathan Wu of Chinatown's famed Nom Wah Tea Parlor have teamed up with chef Richard Kuo (formerly of Pearl & Ash) for the market's Nom Wah Kuai stall, which serves up five of their signature dumplings, like shrimp & snow pea leaf and pork siu mai, along with new, market-exclusive additions, like rice bowls topped with crispy pork, chicken, or tofu. 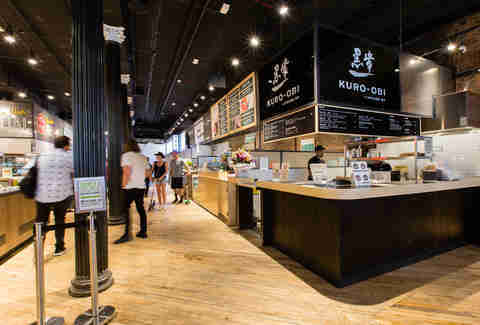 For those who’d rather not wait hours to get into Ippudo's East Village or Midtown locations, the beloved ramen spot is offering to-go options at its spin-off stall, Ippudo Kuro-Obi (which has also popped up at other food halls across the city). The four, market-exclusive ramen options all feature a chicken soup base -- a departure from the pork-based broths at Ippudo's main locations -- and each bowl is served with scallions, mushrooms, and sliced chashu pork on top. Pork buns and edamame are also available. 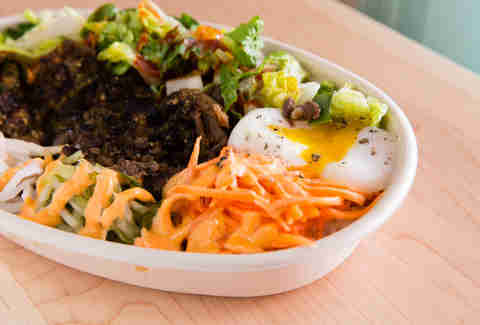 OPPA (also at the Gansevoort Market) presents a modern twist on Korean BBQ, with bibimbap rice bowls as well as salads, burritos, and tacos made with your choice of bulgogi beef, sesame chicken, spicy pork, or tofu. The stand is also offering a bulgogi steak sandwich that's exclusive to the market. 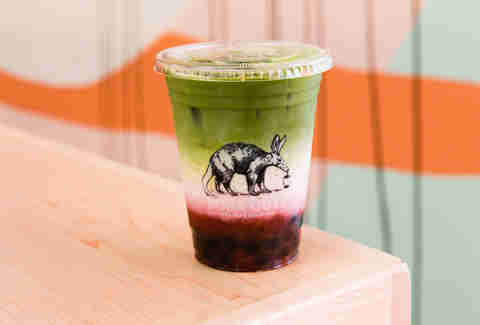 Boba Guys, the cult-favorite, boutique boba shop, has set up its third location at the Canal Street Market, focusing on a myriad of boba milk teas, like a coconut green tea, strawberry matcha latte, and a dirty horchata. This month’s temporary vendor in the rotating Canal Street Market Lab space is a spin-off of the Lower East Side's Petee’s Pie Co., which specializes in savory and sweet pies. 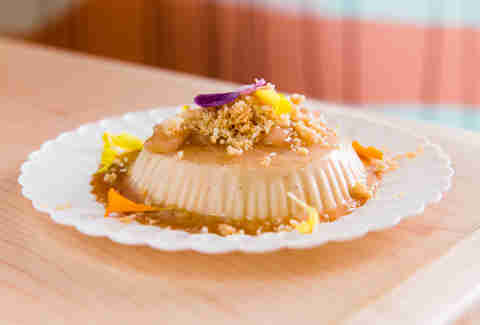 Finish off your food tour with one of the stand's sweet takes -- like the blueberry shortcake with biscuit nuggets, blueberry sauce, and sour cream -- or a non-pie special, like the Flan de Cafe with Parlor coffee cold brew (which is a swirl of caffeinated custard doused in caramel sauce and topped with edible flowers). Amy Schulman is an Editorial Production Assistant at Thrillist who has discovered that food halls turn one meal into at least three. Follow her on Instagram.